Given the increased attention privacy is now receiving, lawyers need to be up to date on what the states are doing, with California leading the charge. Congress is also looking at passing privacy regulation on the federal level, which would pre-empt all state privacy laws. These recent Privacy developments will provide an active subject area for our spring privacy seminar. Registration for the 2019 Venture Law Summit is open! The VLS is happening on Friday, March 29, 2019 from 8:00am to 1:00pm at the University of Denver, Sturm College of Law. This year's VLS boasts expert panelists and keynotes in startup capital raising, marijuana ventures, legal ethics, impact investing and social enterprise, and intellectual property. Kevin Saunders, the General Counsel of Accion International, and Rachel Carlson, the CEO of Guild Education, will keynote the VLS. Registration fees are $50 for attorneys seeking CLE credits, $25 for all other attendees, and free for all college and graduate students in Colorado. CLE credits (including ethics credits) are pending approval. For more information and registration, please visit this link: https://goo.gl/en34mv. If you have any questions, please email Becky Stifter (rstifter19@law.du.edu). Kylie Schmidt, an attorney with Leventhal Trial Lawyers. The EU General Data Protection Regulation (GDPR): Impact on the U.S. The University of Denver Law School will be hosting a discussion on European Union’s General Data Protection Regulation (GDPR) on the morning of Friday, October 26, 2018. Join Liz Harding (Polsinelli), Professor Margot Kaminski (University of Colorado) Nicole Tachbiana (Oracle), David Zetoony (Bryan Cave) and our own Professor John Soma as they discuss how GDPR is and will affect U.S. businesses. Register here http://dughost.imodules.com/s/1150/community/index.aspx?sid=1150&gid=1011&pgid=17789&cid=31665&ecid=31665. The University of Denver is hosting a talk from the European Patent Office. The EPO will be represented by a number of its patent examiners and they will discuss what the European Patent Office is and why it matters to U.S. innovators. Their talk will also cover basics for applying for patents in Europe and how that process differs from the process in the United States. The event is free to the public. Click here to RSVP. Tuesday May 1, 12:00 p.m. Contact Privacy Foundation Event Coordinator Sarah Brunswick at sbrunswick@law.du.edu. (Kindly RSVP so that we may get an estimated head count for food order). On January 19, 2018, second year law students, Leigh Horton and Harris Khan, participated in a mock oral argument for Oil States Energy Services, LLC v. Green’s Energy Group, LLC before almost a hundred attorneys of the Colorado IP Inn of Court. Ms. Horton and Mr. Khan represented the petitioner arguing that the patent office’s current inter partes review procedure violated the Constitution by extinguishing a private property rights through a non-Article III forum without a jury. The panel of judges was made up of Magistrate Judge Kristen Mix, Magistrate Judge Nina Wang and Nathan Kelley, Deputy General Counsel for Intellectual Property Law and Solicitor for the U.S. Patent Office. On January 19, 2018, the University of Denver was honored to host Nathan Kelley, Deputy General Counsel for Intellectual Property Law and Solicitor for the U.S. Patent Office and Molly Kocialski, Director of the Rocky Mountain Regional Patent Office, for a small group breakfast with interested Denver Law students. Come learn what the big deal is about FCC’s recent decision to revoke rules on Net Neutrality. The Federalist Society will be hosting a discussion on the Net Neutrality featuring Professor Derigan Silver, associate professor in DU's Department of Media, Film and Journalism Studies and Professor Justin (Gus) Hurwitz, Assistant Professor of Law at the Nebraska College of Law and Co-Director of its Space, Cyber and Telecom Law Program. 12 p.m to 1 p.m.
Join us to hear our panelists’ stories and learn what the Denver landscape in IP looks like today. See what a typical day looks like and discover the common obstacles that occur within the first few years. Lunch will be provided from The Corner Bakery. On January 3, 2018, Professor Bernard Chao authored and filed an amicus on behalf of 18 intellectual property professors in support of Eve-USA's petition for certiorari to the U.S. Supreme Court. The amicus brief argues that the underlying Federal Circuit decision's failure to apportion lost profits does not account for the realties of modern electronic devices. These devices contain thousands, if not hundreds of thousands of different features, and awarding all the lost profits for infringing one patented feature overcompensates patentees and deters complementary innovation in hi-tech industry. On November 24, 2017, Professors Ian Farrell and Bernard Chao (with Professor Christopher Robertson from the University of Arizona Law School) wrote an op-ed for the Arizona Republic entitled, Police Shouldn't Access Your Phone's Data Without a Court Order. The Op-Ed discusses Carpenter v. United which was argued before the U.S. Supreme Court on November 29, 2017. Relying on data that they previously gathered about the public’s “reasonable expectations of privacy", Professors Farrell, Chao and Robertson argue that law enforcement should not be able to track a cell phone movement’s without first getting a search warrant. In August 2017, Associate Professors Bernard Chao and Ian Farrell contributed to an amicus brief in Carpenter v. United States, a case pending in the U.S. Supreme Court that examines whether the warrantless search of historical cellphone records revealing a user’s location and movements is permitted under the Fourth Amendment. The amicus was signed by 13 colleagues from other law schools, including Northwestern University, University of California, Berkeley, the University of Michigan and the University of Arizona. Relying on a number empirical studies including one co-authored by Chao and Farrell (with Robertson and Durso), the brief urges the Supreme Court to reverse the Sixth Circuit’s decision to allow the cell phone records. Professor Chao was interviewed on the WashingTech Policy Podcast on June 13, 2017. The episode was entitled “How Much Privacy Should You Expect in the Digital Age?” and it focused on different emerging technologies that law enforcement is using and legal implications under the 4th Amendment. The podcast can be found here. 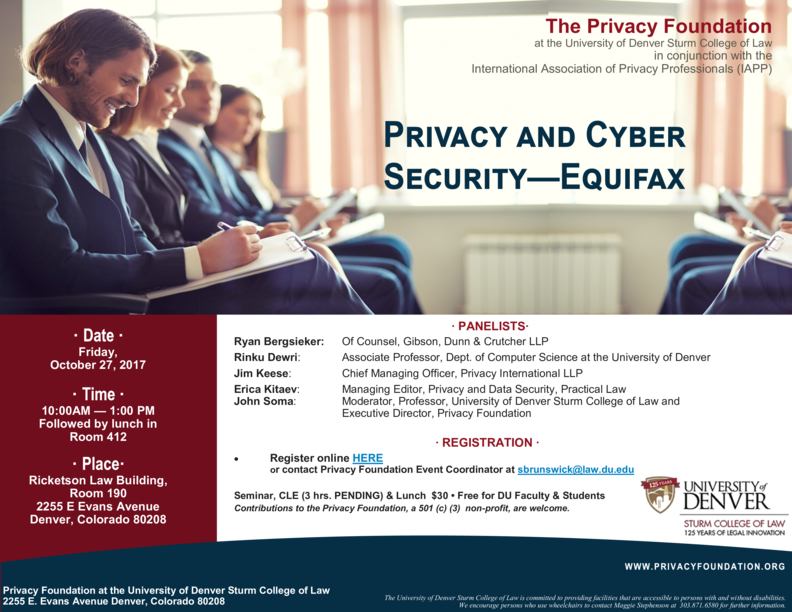 On April 28, 2017, Professor John Soma hosted a seminar entitled “The Privacy/AI Interface.” The panel included experts in both law and computer science. On April 10, 2017, Professor Bernard Chao filed an amicus brief on behalf a number of intellectual property professors in support of Samsung’s petition for certiorari to the U.S. Supreme Court. The amicus brief argued that the underlying Federal Circuit decision had incorrectly weakened the standard for issuing permanent injunctions and that the lower standard could lead to patent holdup. Coverage can be found here. On December 2, 2016, Professor Bernard Chao served on a panel at Frontiers in Precision Medicine II: Cancer, Big Data and the Public … Conference at the University of Utah. The panel discussed the latest issues in patenting precision medicine. The Washington Journal of Law Technology & Arts will be publishing student Christopher Ainscough’s (JD ’18) paper, Deepsouth Will Rise Again — The Argument In Favor of the Federal Circuit’s Holding in Promega v. Life Technologies, later this year. The Supreme Court recently granted certiorari in Promega, a case that will likely clarify when manufacturers will be liable for supplying components abroad under 35 U.S.C. § 271(f)(1). Ainscough argues that supplying a single component should be considered an infringing act provided that the component is a material portion of the components especially adapted for use in a patented invention. Welcome to Lucas Osborn, our fall 2016 visiting associate professor. Professor Osborn is an expert in the area of intellectual property law, with a focus on patent law. On May 20, 2016, the IPLP and the Constitutional Rights & Remedies Program (CRRP) hosted a joint reception for spring 2016 graduates at Professor Chao’s home. Click here for a slideshow.